Would You Like Coffee with that Peppermint? So Starbucks has begun their 4 day span of offering a Buy One Get One on their Holiday Drinks. They do this every year and it’s a great way to try the specialty drinks. Especially since these drinks are offered for only a short period of time each year. Starbucks is pretty expensive and many of their drinks offer a good deal of calories. Yes, I do enjoy Starbucks from time to time but I usually stick with the same drinks. I like the Skinny Iced Vanilla Latte, the Skinny Vanilla Latte and an Iced Coffee with just a little bit of skim milk and a shot of vanilla. For this Holiday Special, Starbucks is offering the Peppermint Mocha, Gingerbread Latte and Caramel Brulee Latte. First on the list to try was the Peppermint Mocha. I stopped by Starbucks on my way home from work on Thursday and ordered a tall, skinny Peppermint Mocha for Mommy and a tall, skinny Iced Peppermint Mocha for me. It was warm and I just didn’t want a hot beverage. I only ordered the tall size because they are only 100 calories, it was 4:45pm and I was going to work out. I normally don’t order a tall and geez, did I forget how small 12 oz really is! One of my biggest disappointments with Starbucks is how much their product varies from one store to another. It varies even from within each location. The barista’s are all trained to follow a set way of making the drinks yet they never taste the same. Normally, they are either really good or really bad and full or half empty. This greatly irritates me. My drinks arrived quickly and I put the tiny little cups in my cup holder and headed home. I mixed mine up a little bit and took a sip. Bam! Pow! KaBamPow! Peppermint! Peppermint! Peppermint! Filling my mouth in one little sip. Wow. There was a lot of peppermint flavor in that sip. It seeped down my mouth, throat, stomach, entire body and filled me with peppermint flavoring. Now, I am not a huge fan of peppermint flavor to begin with. I like it but I don’t love it. As I continued to drink the remaining 3 sips of my drink, all I could taste was peppermint. There was no flavor of coffee, espresso, mocha, steamed milk – nada! Just pure and plain peppermint. And a whole lot of it. Now, chances are pretty good that this is not how Starbucks planned on this drink tasting. 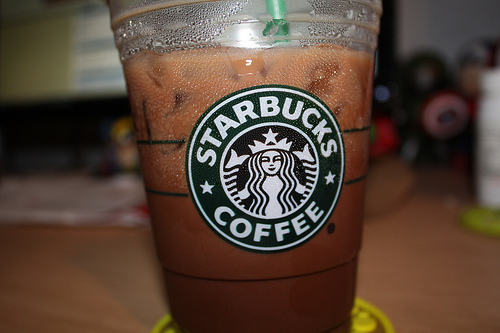 The drink should have been a lovely mocha/espresso/coffee flavor mixed with hints of peppermint in every sip. But, for me, this was not the case. They forgot the mocha/espresso/coffee and just gave me loads of peppermint. Mommy had a hot Peppermint Mocha and didn’t complain of the insane peppermint flavor. I am really glad that I got this via the Buy One Get One deal. I really don’t think I will ever have to have one of these again. Perhaps if I could get it for free, I would give it another try and hope for a bartista who remembers the coffee and holds back on all of the peppermint. This drink has the potential for being really good and it is disappointing that it is so not good. At least I only had to waste 100 calories on this – disappointing waste but at least a low waste. Be sure if you go to Starbucks to order this, you remind your bartista to put some coffee in it…otherwise, you will have to deal with the flavor of overbearing peppermint all day long.